At Bella, we use ingredients sourced from real Italian-family producers, like the Gaetarelli family in Lake Garda who make fresh pasta for us. We love to work closely with family-run businesses to bring you ingredients full of the Italian sunshine, while our Executive Chef Vittorio Lettieri brings his Italian heritage to every delicious dish on our menu. The food at Bella is all created by our Executive Chef, Vittorio Lettieri. Vittorio grew up near the Amalfi Coast in Southern Italy, in a picturesque and historic town called Avellino. Here he lived with his parents and six older brothers and sisters. As the youngest of seven children, he often spent time in the kitchen with 'Mamma' helping prepare food for the whole family. It's from these early days where Vittorio grew to love cooking. 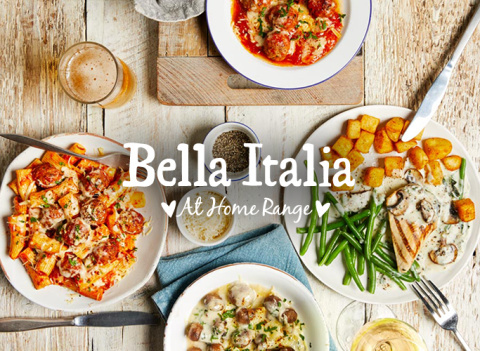 Whether it’s a romantic meal for two, a family gathering or great conversation with friends - Bella is the place to be, with guaranteed fantastic food, welcoming service and warm Italian hospitality! We also cater for special events & celebrations, so we're always ready to help you celebrate in true Italian style! BIG NEWS ALERT! We’ve launched in Tesco supermarkets! LUNCH AT BELLA! 2-courses for £6.99 or 3-courses for 9.49!